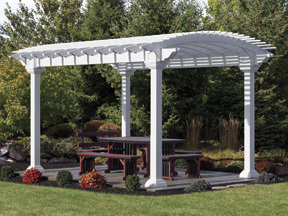 Pergolas by Baldwin | Vinyl Pergolas, Wooden Pergolas, Fiberglass Pergolas, Pergola Kits, and More! 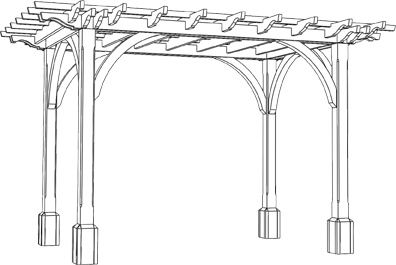 We offer four types of pergolas. How will you decide? 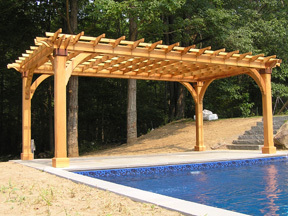 This section will provide basic pricing and limited inforamtion for our pergolas and pavilions. 14' x 18' patio = 16.5' x 20.5' Price: 9,438 includes 12" inch diameter columns. 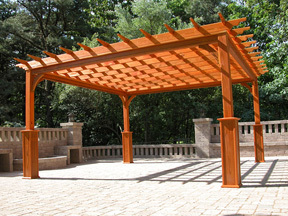 A 10' x 14' foot patio will support our 13' x 17' Cedar pergola. Popular upgrades: Shade systems, leg base trim or leg upgrades to 8x8" square or 10" round. Almond color available. A rustic, mountain style pavilion crafted in Western Red Cedar. A 10' x 14' foot patio will support our 10' x 14' Gable Pavilion. What's included: Mounting brackets and ALL hardware, 8x8 cedar Posts with bracket-concealing trim, beams, braces, truss members, rafters and all roof framing, roof decking and trim, your choice of wood stain colors, architectural asphalt shingles, instructions and warranty. A refined, somewhat Victorian style pavilion with arching beams and detailed trim work. 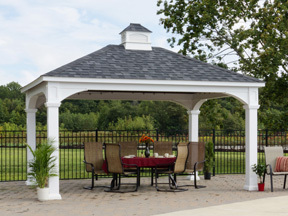 This pavilion has a steep roof pitch and looks great with asphalt shingles or a metal roof. A 10' x 14' foot patio will support our 10' x 14' Arched Pavilion. 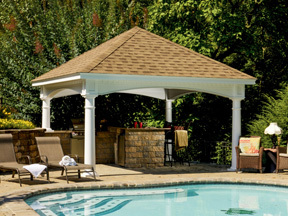 What's included: 10" inch diameter vinyl columns with lumber and mounting brackets concealed within, broad arching beams with dental molding, hip roof with a steep pitch and twelve inch overhangs, 1x6 southern yellow pine roof decking with mahogany stain carefully trimmed in viny, architectural asphalt shingles, all hardware, instructions and warranty. Popular upgrades: Standard or standing seam metal roof, electrical package, Ivory color package. A well balanced and proportioned pavilion with beautiful exposed, mahogany stained, hip roof interior. Zero maintenance. A 10' x 14' foot patio will support our 10' x 14' Traditional Vinyl Pavilion. What's included: 6" x 6" white vinyl posts with lumber and mounting brackets concealed within, strong braces concealed withing arching vinyl trim. A hip roof with a six in twelve pitch, 1x6 southern yellow pine roof decking with mahogany stain, carefully trimmed in vinyl, architectural asphalt shingles, all hardware, instructions and warranty. Popular upgrades: Ivory color: add 10%. Leg upgrades to 10" round or 8x8 square. A well refined but somewhat simple pavilion built with kiln dried, pressure treated, southern yellow pine whcih is as hard as oak, but lasts forever. 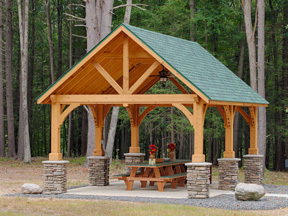 A 10' x 14' foot patio will support our 10' x 14' Traditional Pine Pavilion. What's included: 5" x 5" pressure treated, kiln dried, southern yellow pine throughout. Posts with powder coated mounting brackets, concealed within wooden post base trim. Strong braces. A hip roof with a five in twelve pitch, 1x6 southern yellow pine roof decking with mahogany stain on the interior, architectural asphalt shingles, all hardware, instructions and warranty. 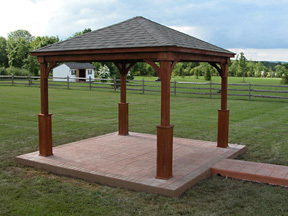 Popular upgrades: Stain on posts and beams: Add 8%, Leg upgrades to 10" round or 8x8" square. 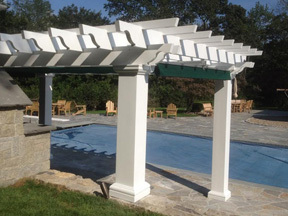 The pergola looks amazing and you and your team went above and beyond the call of duty. I'd also like to thank you for helping to get our kitchen cabinets off the delivery truck and into our driveway. You and your team have been true professionals and I would be glad (and proud) to be a referral in the future. I'll be sure to send pics once the outdoor kitchen is completely installed. Thanks again. 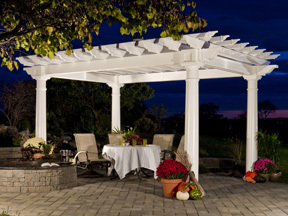 Hello Max, It took awhile but here are some pictures of the beautiful pergola. When were done with the project I would like to send you a better picture. 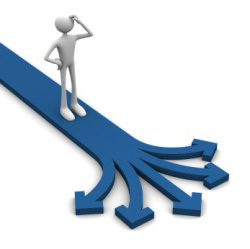 I was great working with you & I�ll e-mail you when it is complete. Thank You. Max, I will send you some photos as soon as we install the paddle fan. Running wire was fine. It looks great! The Pergola looks wonderful! The arches came out great. This is exactly what we were looking for. We spent most of the day yesterday putting it together and finished late afternoon. It went together smoothly and everyone helped. We had fun setting it up. Thanks for spending the day with us and working with us through all of this. We love it!